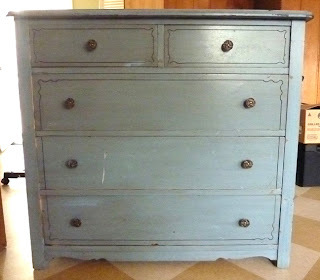 Too often, the word "vintage" evokes images of beat-up three-legged furniture waiting for a merciful one-way trip to the dump, or rusty garden tools that have seen twenty-or-so seasons too many. 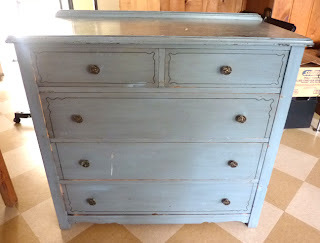 But this little blue dresser is oh, so darling, and so French chic without the froufrou, and so sad you haven't found it yet. Stylish and functional with five roomy drawers, this dresser will enhance your decor and give it that classy "BCBG -bon chic bon genre-" French-style touch. Dimensions: 36" x 18" x 34."